How self-driving technology could transform everything from retail to transit. Enlarge / Nuro is designing a small electric vehicle for hauling cargo. It is designed to be street-legal but has no room for passengers. When people think about self-driving cars, they naturally think about, well, cars. They imagine a future where they buy a new car that has a "self drive" button that takes them wherever they want to go. The advent of self-driving technology will transform the design possibilities for all sorts of vehicles, giving rise to new vehicle categories that don't exist now and others that straddle the line between existing categories. It will also change the economics of transportation and delivery services, making on-demand delivery a much faster, cheaper, and more convenient option. Earlier this month, the startup Drive.ai that will launch in July in the Dallas metropolitan area. The company's vehicles straddle the line between buses and taxis—like a bus, they're designed for shared service in a fixed area, but rather than being on a fixed route and schedule, they can be hailed on demand. Meanwhile, Nuro is building self-driving cars for moving goods instead of people, and it recently applied for permission to test its fully driverless vehicles in Arizona. Because Nuro's cars don't need room for passengers—or all the safety equipment a human rider needs—Nuro's cars can be much smaller and lighter (and therefore cheaper and safer) than a conventional car. 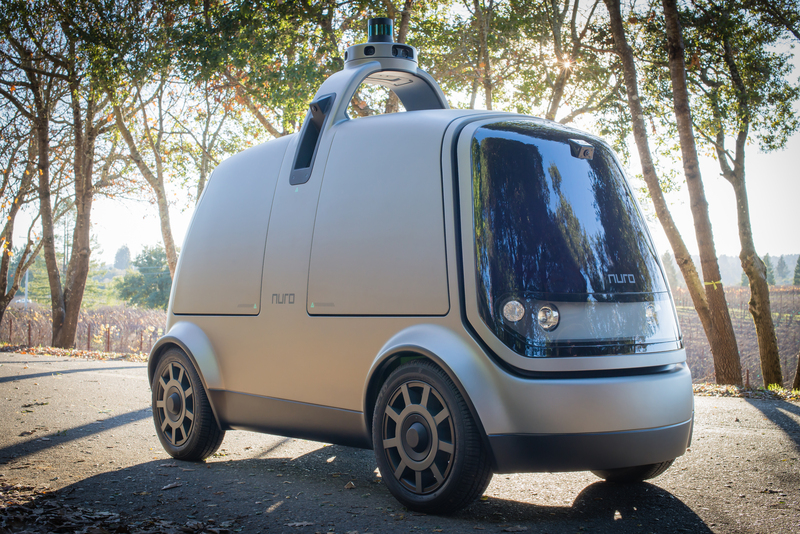 You can think of this as a high-tech replacement for a pizza delivery guy, but Nuro co-founder Dave Ferguson argues that the potential market here is much bigger. Without the need to pay a driver, on-demand deliveries will become much cheaper, so a lot more stores will offer delivery services. Instead of running to the grocery store for a couple of ingredients, you'll be able to order them on your smartphone and have them show up at your door 30 minutes later. But other people rely on third-party services to move themselves and their purchases. 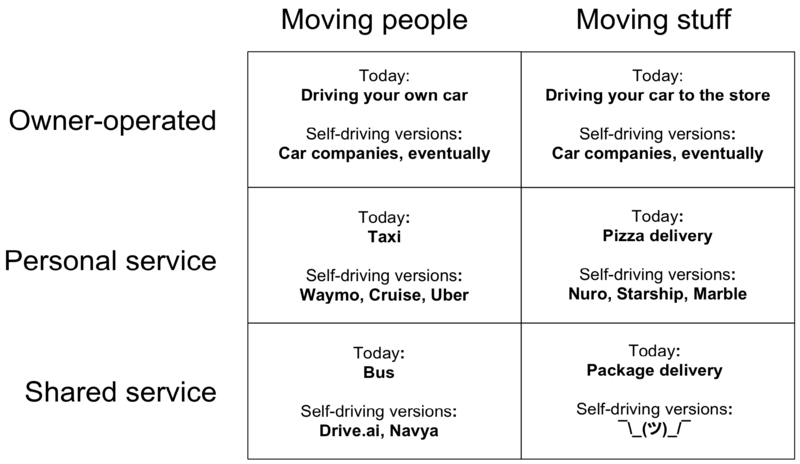 Today someone who wants to get around without owning a car can choose between a taxi or a shared mode of transit like a bus (or a train in some areas). Taxis are faster and more convenient, but they're expensive enough that only wealthy people can afford to use them on a daily basis. The story is similar when it comes to moving stuff around. You don't have to drive to a store to buy stuff. You can also have it delivered. And there are two basic options here. Most products are delivered using a service like UPS or FedEx, and it takes a day or two to get your stuff to you. But some companies, like pizza restaurants, offer personalized on-demand deliveries measured in minutes rather than days. The tradeoff here is similar to the taxi-vs-bus tradeoff. On-demand services are faster and more convenient for customers, but they're so expensive that they tend to only be used in cases (like pizza delivery) where slower, cheaper options aren't practical. Self-driving technology will also blur the lines between these technologies. Right now, taxis and buses are physically very different: a taxis is usually just a conventional car with a "taxi" sign on top, while most city buses are enormous vehicles with room for dozens of passengers. But Uber and Lyft have already started to blur the line between a taxi and a bus. Uber Pool and Lyft Line are shared services that preserve most of the benefits of a conventional taxi ride while offering fares that are closer to what you'd pay to take the bus. When Lyft announced a new carpooling service that operated along fixed routes last year, it was greeted with mocking headlines like "Silicon Valley Invents Bus." But the mockery was unwarranted. Buses are an important mode of transportation for millions of people, and so if Uber and Lyft can figure out how to make bus service more efficient and convenient for customers, that would be a big accomplishment. Self-driving cars will only accelerate this trend. City buses are as large as they are largely to minimize the number of drivers needed to drive people around. Once buses drive themselves, it will be economical to use smaller buses that run more often. And smartphone hailing technologies could allow buses to become more flexible in terms of both routes and schedules. This is exactly the vision that Drive.ai is pursuing. 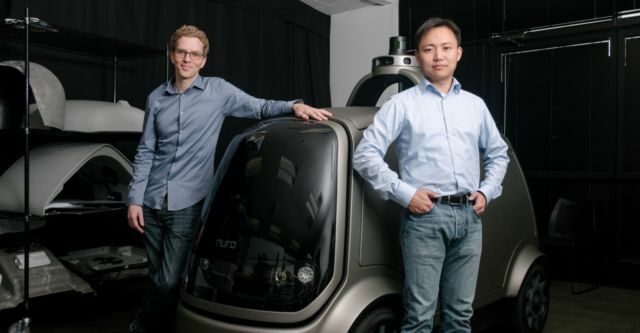 When I talked to Drive.ai's Conway Chen, he refused to be pinned down on whether the company's service was a taxi service or a bus service. The reality is that it's somewhere in between. Drive.ai's first service will be in the North Platinum Corridor, a commercial area in the Dallas suburb of Frisco. It's primarily a cluster of office buildings surrounded by big parking lots, but the area also includes some restaurants and a new development called Frisco Station, which will include some apartments. Drive.ai will provide a fleet of bright orange vans that will move people around the North Platinum Corridor. The company expects that initial use will be concentrated around lunch time, with workers traveling from their offices to nearby restaurants. Like a conventional bus service, Drive.ai's Frisco service will provide service between six fixed stops. But there's no fixed route schedule—shuttles will be hailed on demand. And the system is bus-like in another way, too: the company has worked closely with local governments and area businesses on the development of the service, and it hopes to eventually receive financial support from them. 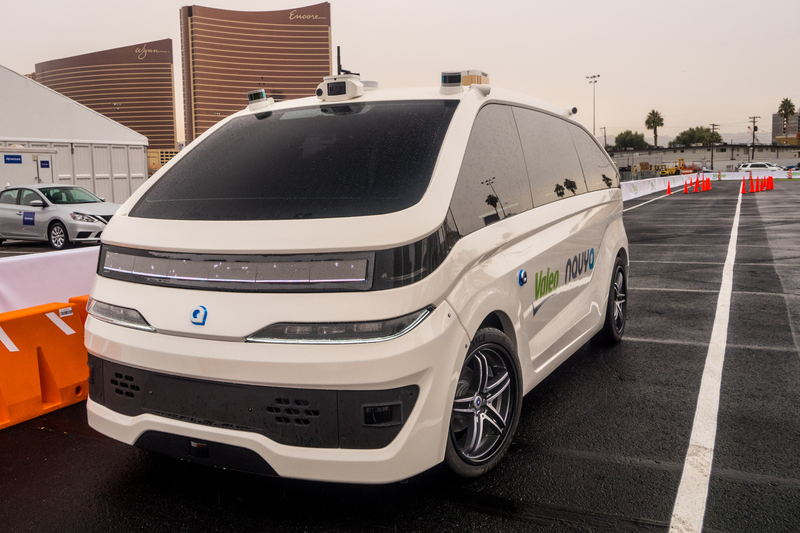 "Maybe these kinds of vehicles are the future of transit"
Enlarge / A Navya vehicle in Las Vegas earlier this year. Thomas Bamonte, an official at the Central Texas Council of Governments who helped to organize the Drive.ai project, argues that this makes Drive.ai's service different from Waymo's forthcoming taxi service in Phoenix. "I think it's probably good to think of them as complementary," Bamonte told Ars. "Waymo is a longer-distance taxi service. Drive.ai is exploring campus and district-scale deployment. 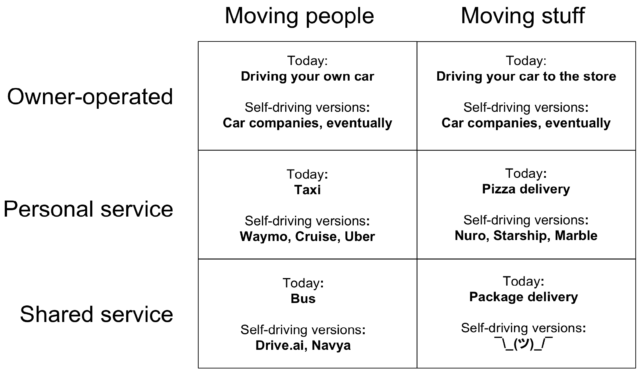 You may see the emergence of two distinct forms of autonomous vehicles—one serving longer trips, one on internal districts." An obvious question is why not just have one service that performs both functions. After all, Waymo's cars can do short-distance trips as well as long ones. And if people use Waymo cars to commute to work in the morning and return home in the evening, there will be a bunch of Waymo cars hanging around people's offices during the day—those cars could do lunchtime trips, too. But coordinating closely with local governments or private partners, as Drive.ai is doing in Frisco, may provide real advantages. The owners of large apartment or office buildings might be willing to subsidize shuttles going between their properties and nearby attractions—like a subway stop or grocery store—in order to enhance the property's value. And while self-driving technology will make taxi service cheaper, it may not make it cheap enough that everyone can afford to use it. So cities may want to develop a self-driving successor to the taxpayer-subsidized city bus. 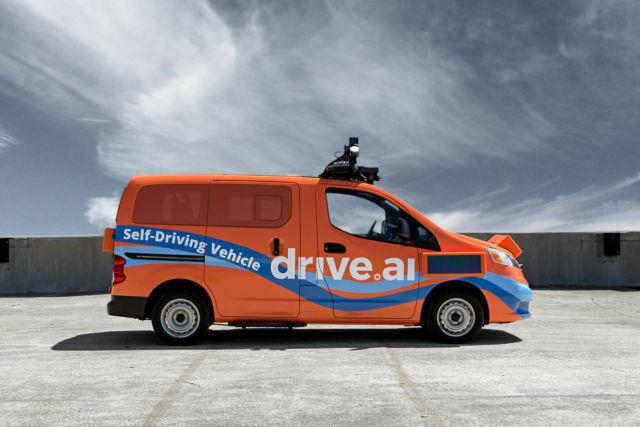 And it might look like an expanded version of Drive.ai's Frisco project, with self-driving shuttles taking people between hundreds of "bus stops" using dynamically planned routes. "Maybe these kinds of vehicles are the future of transit," Bamonte told us. "So everything will come down to kind of on-demand buses, and the size of the vehicles will depend on the demand along the routes." Another possibility, Bamonte said, is a "first-mile, last mile" model. Self-driving shuttles like Drive.ai's would take people from their homes to the nearest conventional bus or subway stop. People would then ride to a point near their destination, where another short-range shuttle would meet them and take them to their final destination. A well-designed system could charge passengers a single fare for the entire multi-leg trip and coordinate pickup and drop off times to minimize the wait between steps. This model could improve the usability of conventional transit in low-density suburban areas where most homes are not close to a bus stop. At the same time, it could allow stops along a conventional bus route to be spaced farther apart, shortening the average travel time. "We see this period of testing and deployment as an opportunity where communities can step back and say 'here's what we've done over the past half-century with land use planning, and transportation planning," Bamonte told us. "That's why having the Drive.ai deployment here is so exciting—it gives us a chance to see what may work." Drive.ai isn't the only company working on shared mobility services in close partnership with local governments. A French startup called Navya has been pursuing a similar business model, operating a three-stop driverless shuttle route in downtown Las Vegas, and the company has also been operating a similar service in Lyon, France, since 2016. The company has larger ambitions. In January, it demonstrated a taxi cab in Las Vegas capable of traveling up to 55 miles per hour. Navya's partner for a number of these projects has been Keolis, a French company that operates a number of public transit services around the world. The bottom line is that riders of the future will enjoy a range of options when it comes to mobility services. With no driver, taxis will be much cheaper. Taking the bus will be more convenient, as the average wait between buses will be shorter. People may have the option to take a free shuttle to their nearest bus stop. And there are likely to be shared services that fall somewhere between a taxi and a bus, with flexible routes and schedules but lower costs than a conventional taxi. The impact of autonomous vehicles on the retail sector could be even bigger. For all of Amazon's growth, the company still has only about 4 percent of the overall retail industry. The vast majority of people still buy stuff the old-fashioned way: by driving their car to the store, buying stuff, and driving the purchases home. This means there's still huge potential for delivery services to disrupt conventional retail stores if they can be made faster, cheaper, and more convenient. And this is the market being targeted by a number of startups that are working on small autonomous vehicles. Some of these companies, including Marble and Starship, are working on small robots designed to travel at walking speeds on urban sidewalks. But Nuro is working on a larger vehicle with a maximum speed of 25 miles per hour—eventually 35 miles per hour—that's designed to operate on city streets. That higher speed means a greater range, making it a potential substitute for shopping trips people do in their cars today. While Nuro's custom-designed cars are bigger and faster than some rivals' sidewalk robots, they're still much smaller and slower than conventional cars. And Ferguson, the Nuro co-founder, told us that has major safety advantages. "If you're focusing purely on transporting goods and don't need to worry about people, you can do some pretty amazing things around how you design that vehicle and how you design the behaviors of that vehicle," Ferguson said. Much of the weight of a conventional vehicle comes from the need to protect passengers in a crash. But if a vehicle is only designed for cargo, it can be much lighter and simpler. The lack of passengers also means Nuro's software can always prioritize the safety of people outside the vehicle. This means that the vehicle can be extremely conservative about slowing down if it encounters a situation it doesn't fully understand. And of course, a lighter vehicle with a maximum speed of 25 or 35 miles per hour is far less likely to kill a pedestrian than a full-sized vehicle traveling at highway speeds. "Our vehicle is half the width of a Toyota Corolla," Ferguson told us. "If you think about it from a pure safety and flexibility standpoint, we have an extra 3-4 foot of safety buffer in terms of width that we can dynamically position around the vehicle." For example, suppose there is a row of parked cars on one side of a Nuro vehicle; it can then hug the opposite side of its lane, giving it more time to brake if a child darts out between two parked cars. Targeting lower speeds has also made some of the technical challenges easier, Ferguson told Ars. One of the big obstacles to fully self-driving passenger cars is the need for lidar with enough range—around 200 meters—to drive at highway speeds up to 70 miles per hour. The 25 mile-per-hour top speed of Nuro's initial model—and correspondingly short stopping distance—means that today's lidars have ample range to see potential obstacles in time to stop for them. The technology is coming soon, Ferguson said. "We're hoping to run a limited service with a real partner and real customers within this calendar year." And a service like this could have a dramatic impact on the retail sector. "Right now, there's not really a way to say 'I'd like these three ingredients for dinner,'" he continued. "There's no way to have that delivered at any price." But technology like Nuro would make it possible for almost any store to offer deliveries measured in minutes rather than hours or days. Ferguson said the exact cost will depend on a variety of factors, but he argues that delivery costs could get down to a dollar in the long run. Stores may even cover these costs and offer free delivery. Eventually, the very concept of a store could change radically. For standardized, non-perishable goods, there may be little reason for customers to set foot in a store at all. The retail industry could become dominated by fleets of delivery robots and distributed warehouses that stock them. This model probably won't work for every store, of course. People like to try on clothes and inspect produce before they buy them, and some stores specialize in offering customers expert advice and hands-on product demonstrations. But even in these parts of the retail sector, innovations might be possible. A car that can make rapid deliveries can also make rapid returns. So a clothing retailer might send customers a dozen outfits in a drone, then have it wait in her driveway while she tries them on and sends back the ones she doesn't want. Zappos pioneered a version of this business model for shoes a decade ago, but the faster turnaround and lower cost of autonomous deliveries could make it viable for a much wider share of the market. I asked Ferguson if the Nuro model would worsen urban congestion problems, but he argued that the opposite is more likely. After all, most purchases today are accomplished by someone driving a comparatively enormous passenger car to a store and back. Replacing a human-driven trip with a Nuro trip doesn't increase the number of vehicles on the roads, and Nuro vehicles are much smaller, lighter, and less polluting than the average car. Moreover, as on-demand delivery services grow, there will be substantial room for a single trip to serve multiple customers. 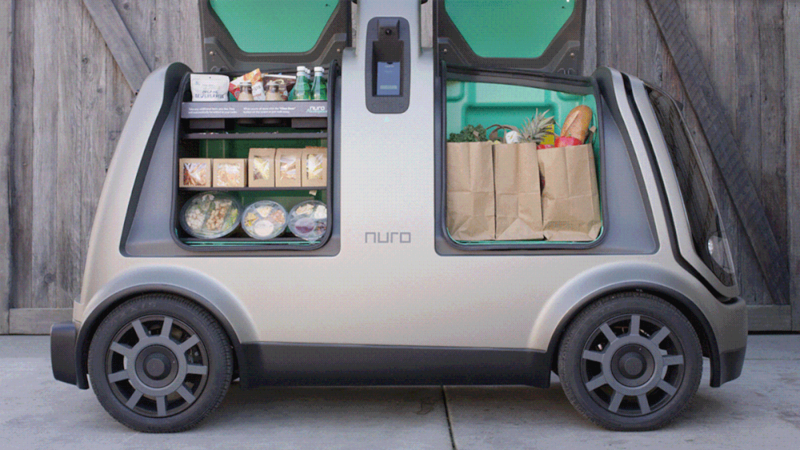 Nuro's initial cars have two compartments, allowing it to serve two customers with each trip by default. But Ferguson says that those large compartments can easily be subdivided for retailers delivering small items. And of course, in the future Nuro could make larger versions of its robot with space to hold more merchandise. So as the volume of orders grows, stores should be able to group together orders in nearby neighborhoods that happen around the same time. That means that at scale, a fleet of delivery robots could wind up taking up less space on the roads than the fleet of conventional human-driven cars we use to go shopping today. And just as driverless cars are likely to blur the distinction between taxis and buses, we can expect driverless delivery vehicles to blur the line between on-demand deliveries and conventional package services. Nuro isn't planning to directly challenge UPS and FedEx, whose shared delivery model is relatively efficient. But in the long run, established delivery companies will face pressure to use autonomous vehicle technology to deliver packages in hours rather than days.